Who Says NATO Is Irrelevant? Policy leaders are reflecting on the legacy and future of NATO this week, the anniversary of the alliance’s creation 67 years ago. One of them is Luke Coffey, director of the Allison Center for Foreign Policy Studies at The Heritage Foundation. “[U.S.] involvement in NATO means that Europe stays relatively secure and calm. And we’re not fighting wars in Europe anymore,” Coffey told The Daily Signal. The signing of the North Atlantic Treaty on April 4, 1949, marks the founding of NATO, formally the North Atlantic Treaty Organization. President Barack Obama met with NATO Secretary General Jens Stoltenberg upon the 67th anniversary Monday to discuss troubling developments including the Islamic State terrorist army, also known as ISIS, and the recent Brussels terrorist attack. 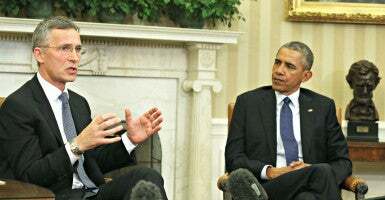 “It is because of the strength of NATO and the transatlantic partnership—this transatlantic alliance—that I’m confident that despite these choppy waters, we will continue to be able to underscore and underwrite the peace and security and prosperity that has been the hallmark of the transatlantic relationship for so many decades,” Obama said. World leaders formed the international alliance after World War I and World War II to prevent another devastating conflict. All 28 member countries today—including other world powers such as the United Kingdom, France, and Germany—work in consultation to reach decisions on important defense and security issues. If diplomacy fails, the organization can use military force to resolve a crisis affecting its members. In his previous role as Heritage’s Margaret Thatcher fellow, Coffey focused on relations between the United States and the United Kingdom and on the role of NATO and the European Union in transatlantic and Eurasian security. Coffey said the NATO alliance has been one of “the greatest tools of democracy promotion the world has ever seen,” with hope of membership driving many countries to pursue reforms after the fall of the Berlin Wall. An essential part of the organization’s founding mission was to prevent expansion of the Soviet Union. Coffey said the alliance remains critical to preserving international security. “NATO today is there to do the same thing it was doing during the Cold War: to defend the territorial integrity of its member states. During the Cold War, it was the Soviet Union; today, it seems to be Russia,” Coffey said, noting Russian President Vladimir Putin’s use of its military to annex Crimea, invade Ukraine, and provoke the Baltic States. Coffey said NATO should take a “back to the basics” approach to combat a growing threat posed by Russia and should not pursue actions beyond its original mission to defend the territory of member states. “Now is not the time to turn our back on NATO,” Coffey said. Coffey said the U.S. role in NATO “helps make the whole North Atlantic region secure and stable,” with subsequent economic prosperity resulting in a mutually beneficial relationship. “All this is only made possible because of a strong U.S. inside a strong NATO,” he said.